Big Ideas: Do it again, go on! I was reminded of this simple yet profound truth on a webinar I was conducting just last week. This one is important my friends, and very deep. Tune in. And listen to what I am about to share with you. As I always do, I asked my coaching students for their recent good news-bad news stories. I do this so we can all learn from each other, both good and bad. The topic was distribution, and more specifically, how we can increase our service distribution path. I offered an idea and one “student” immediately shared the fact that she had done exactly what I was talking about … and that it worked to perfection. Thrillseekers Travel Club — How much time is left? Having been born in Tampa and spending the better part of my youth on the beaches of Clearwater, Pensacola and Panama City, I have a deep affinity and love for my home state of Florida. After 64 days of continuous oil and methane leaking off the coast of Louisiana, my beloved home state is now at high risk for severe contamination. And the end is nowhere in sight. Do your clients trust you? I’m pretty certain that the degree to which you are at this moment successful as a travel consultant has a lot to do with your native ability to develop a bond of trust with your clients. The mix of the confidence you exude, the knowledge you have and the way you communicate is working for you. To the extent that you are losing sales and have not yet achieved the client base you want, it may be worthwhile to examine the elements of trust and how they are projected through your marketing. Prague is located on the Vltava River in central Bohemia and has has been the political, cultural and economic center of the Czech state for more than 1,100 years. During the Gothic and Renaissance eras, Prague was the permanent seat of two Holy Roman Emperors and was also the capital of the Holy Roman Empire. Currently, Prague has a population of about 1.3 million people. Since 1992, the center of Prague has been listed on the UNESCO list of World Heritage Sites, making the city one of the most popular tourist destinations in Europe. In 2009, it is estimated that Prague was host to more than 4.1 million visitors. Bavaria is Germany’s biggest state with an area of 27,000 square miles accounting for about a fifth of Germany’s total area.It’s in Germany’s south-eastern quarter and has a population of about 12.5 million people. Munich is the capital city of Bavaria and is the third largest city in Germany. Munich was the host city of the 1972 Summer Olympics and is a candidate city for the 2018 Winter Olympics. There’s much more to Bavaria, Germany than just the capital city. Late to the party? I think not! Back when Howard Stern was a relative unknown, there was a statistic floating around that the average Howard Stern fan tuned into the shock jock for 80 minutes a day. The most common reason cited was to hear what he would say next. The average Stern hater tuned in for 150 minutes per day. The most common reason cited was to hear what he would say next. I am not sure how many listeners he had back in the 80s when he was starting out, but it was significant, and look where it got him. If we scale it back a bit, how would you like to have several hundred thousand fans waiting to hear what you had to say next? Not likely for most (if not all) agencies, but a piece of cake for the cruise lines. One of my niche specialties is cruise groups, and fellow travel professionals have contacted me seeking my input on them. This article is the first in a series designed to give you an overview on cruise group basics, including where to find group prospects, how to approach a potential Pied Piper, and how to manage the group financially and administratively to ensure the best possible success. John T. Peters joined Tripology as President and CEO in June of 2008. Most recently, John navigated the company into a purchase by Rand McNally and is now the VP/GM Digital Strategy & Travel. Prior to Tripology, John was Vice President of Business Development & Travel Trade where he led the successful launch of Endless Vacation Rentals by Wyndham Worldwide. Earlier in his career, John founded Zeus Tours & Yacht Cruises, an international yacht cruise/tour and hotel business that grew to over $50 million in sales with over 100 employees in offices in New York, Athens, Rome and Buenos Aires. TRO: John, tell us about the transition of Tripology from independent company to a subsidiary of Rand McNally. So Many Onboard Activities…So Little Time! It amazes me that in these difficult times, some business people don’t work harder to get new clients. Over the years, I’ve taught the travel specialists in my agency to fight for new business, work hard to get repeat bookings and referrals. When I say ‘fight’, I don’t mean ‘discount’, I mean really go above and beyond to ensure our clients get an exemplary experience that showcases us as travel specialists with tons of expertise. The Edge Of Excellence: Are you a specialist in specializing? As a speaker, I end up on a lot of agency mailing lists. From email blasts and Twitter bursts to fax frenzies and snail mail flyers, I get it all. It’s a great opportunity to stay on top of agency marketing efforts. It’s also a reminder of what so many are doing so wrong! When someone mentions Orlando, does your mind immediately go to Walt Disney World–or possibly Universal Studios? While these two attractions are certainly not to be missed, if you limit yourself to these two, you will be missing out on all that the Orlando area has to offer. Perhaps this is not your first visit to the area and you want to see a little more than Disney or Universal has to offer. Why not consider renting a car and staying in home, condominium or villa at a fraction of the cost of a hotel or resort? If you do a little local shopping, you can save even more and prepare some of your meals yourself—breakfast anyone? I had one of “those” weeks. I am not going to sit here and whine or complain about it—that never does anyone any good. 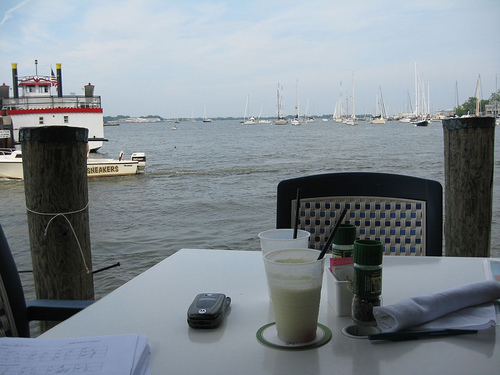 But I will freely admit that writing this column is the last thing I want to do on a Friday night when it is 75 degrees out with a nice breeze and a cool beer waiting for me on the dock at Pusser’s Landing. But, a commitment is a commitment. Besides, topics tend to come easily when you really love what you do! Kids think they cleverly invented ‘how r u’ and ‘lmao’. Puh-lease. Baby talk. A mere step above pig latin, umpkinpehs. Try entering the code for two open-jaws with extra luggage allowance in GDS. Now that’s coding. It separates the agents from the clients. It’s power. Unfortunately, Sabre is doing away with code altogether. They’re going all ‘windows’ on us. Now any lay bimbo with a business card can use Sabre. My definition is doing the right thing, all the time. No matter how difficult it may be. Being responsible for your own actions. Twiggy took her time descending the upper deck stairs to reach the podium on Seabourn Sojourn this past Friday in London, where the iconic 1960’s British model christened Seabourn’s newest vessel on the River Thames. Indeed elegant, Twiggy exploded onto the international modelling scene as a London teenager in 1966. She went on to define the term ‘supermodel’ and to become the icon of 1960s style worldwide. Over the past few months, there have been articles on TRO suggesting perhaps that the travel industry might not be for you. TRO’s Editor, John Frenaye mentioned it and columnist Larry Norman did as well. We broker travel businesses and one of the most common fears I hear is that no one is buying travel agencies anymore. This can’t be further from the truth. There is a different buyer out there in the market, but despite the recession, the market for acquisitions is very robust.